Wow – lots happening in a short time frame! Hannukah,12-12-12, the Solstice, Christmas, a full moon this week, then New Year’s! Before you go bounding excitedly into 2013, pause, breathe, and reflect. Set a timer for 5 minutes and write a list of all the things you accomplished this past week. Big or small, significant or seemingly not, create a list. Then thank yourself out loud. Give gratitude for all you’ve been and done. All of it. This week reflect on the differences you made in 2012. Projects started, tasks completed, friendship developed, health gained, love shared, moments experienced. Then thank yourself for your awareness of the BE-ing that is you. Fold the best of 2012 into next year. Use your joys and accomplishments to step solidly into your creation of 2013! Give yourself a gift, and join Suze Jan, 24 and 31st for This Year’s Going to Be Different! For ways to use Belief Re-patterning in supporting your dreams and desires in 2013! Learn how to create an excellent partnership with yourself, body, mind and soul. How do you find and nurture that place of alignment, and live from your genuine self? This is the focus of today’s re-patterning sessions. What do you wish 2013 will bring? Belief Re-patterning will support you, and those you care about in realizing those dreams. 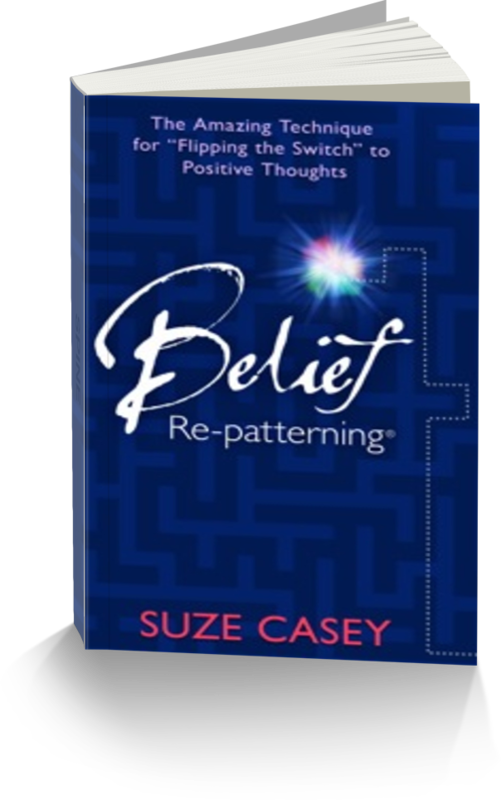 Nurture yourself this holiday season with the gift of Belief Re-patterning. Imagine having friends and family ‘on the same page’, learning to speak to themselves in a kinder and more empowering way. For $30.40 (book + shipping + 5% tax) your gift is on its way! $103.95 adds a gift certificate for the individual session. Belief Re-patterning is about creating more joy, peace and love in the world, and more harmony and ease for You! A 75 minute overview demonstration and Q & A designed to assist you in determining how this technique will support you on your personal or professional path. Join Suze for two, 75 minute interactive calls, looking at your dreams and goals from a different perspective! You’ll clarify what your real goals are, identify the places you have been “hanging yourself up” and Suze will support you in developing some new ways of achieving what you desire. Commit to positive, lasting change in your life. Begin today! The Life you Desire is within Reach! CHOOSE IT. CREATE IT. APPLY IT. LIVE IT. What you believe defines your reality.